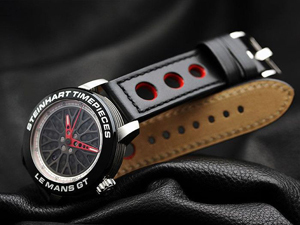 The famous car race 24 Heures du Mans (24 Hours of Le Mans), held annually near the eponymous French town of Le Mans – the focus of the watch company Steinhart. Note that the first 24-hour check-famous race held on May 26, 1923. 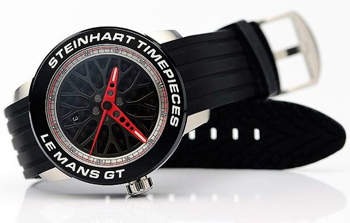 In honor of the sporting event of watchmakers Steinhart watches were created Le Mans GT Automatic. The new “racing” clock made its appearance based on the details of sports. The massive bezel reminds you drive a racing car, registration will dial the association with wheel drive, and the second hand is made, as the speedometer needle. New housing diameter 46 mm and a thickness of 14.5 mm is made of brushed and polished stainless steel. The dial is made of carbon fiber on the method of the so-called “sandwich”. Functions: hours, minutes, seconds, via the central red arrow, date aperture at the position through a “6” hours. Hour and minute hands, as well as the inscription on the bezel are highlighted in blue by using the fluorescent coating. The basis of hours – Swiss ETA 2824-2 automatic movement. Hours are also complemented by a rubber strap black with stainless steel buckle with engraved logo and brand, reminiscent of tread rubber on the back side. However, when buying watches you prefer leather strap, it should be noted that the leather is different underlined in red with red stitching and round holes. 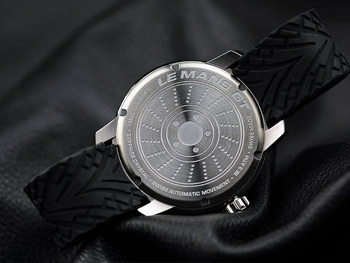 Buy Watches Le Mans GT Automatic can be recommended for the producers price – 490 euros.